Captain Jack Sparrow is back! Leading a team of pirates, zombies and mermaids, the journey to the Fountain of Youth has never been more exciting. Hoh well, apparently, my "ex" Johnny Depp finally returns to his iconic role of Captain Jack Sparrow in an action-packed tale of truth, betrayal, youth and demise and I can't wait to watch this movie on the big screen! PIRATES OF THE CARIBBEAN: ON STRANGER TIDES, produced by Jerry Bruckheimer and directed by Rob Marshall, “Pirates of the Caribbean: On Stranger Tides” captures the fun, adventure and humor that ignited the hit franchise—this time in Disney Digital 3D™. You can get more deets about this movie and get your share of the treasure by going to the All Aboard Sg page, the official page for Walt Disney Studios Motion Pictures Singapore - Pirates of the Caribbean: On Stranger Tides. 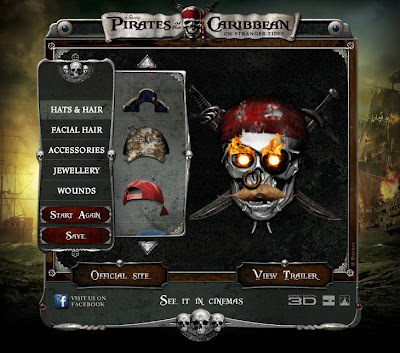 I tried playing one of the 3 games on the Pirates of the Caribbean: On Stranger Tides Facebook Fanpage Games & Activities tab (Pirate Yourself, Battle Galleons or Skull Creator). I played the Skull Creator where you can customize a skull for your profile page and it was really fun cause I get to choose what props to add like the creepy facial hair, wounds, hats, accessories and jewelries to give your skull one thrill and a half fun! LOL From the looks of things, my skull looks weird tho but I like it as it is.. simple and fiery! :D I might try the other games later and see if it's cringe-worthy!